I did some black and white illustrations for a book on helping kids learn yoga relaxation techniques. It brought me back to the time my now 12 year old son would join me for yoga in my living room every morning (he was 2). He got pretty good at the sun salutation. Here's the book in print. You can get a copy for yourself HERE. Writing for Charity is a seminar/workshop for children's book writers, put on by professional authors in Utah who want to give back to their community and the world. The conference was founded by Shannon Hale, NYT Bestselling Author and Newberry Honor Recipient. The Incorrigible Children of Ashton Place is Maryrose's first series for middle-grade readers. Book 1, The Mysterious Howling, was published in 2010 and received starred reviews in Booklist, Kirkus, SLJ and Publishers Weekly, and was named a Best Children’s Book of 2010 by the Christian Science Monitor, Kirkus, and others. It was followed by The Hidden Gallery in 2011. The third book in the series, The Unseen Guest, was published in March 2012. All three titles were named Junior Library Guild selections. Monti has a varied industry background with stops at Barnes & Noble where he was the children’s fiction buyer, Houghton Mifflin where he worked in national account sales, and in editorial spots at Little, Brown. He was an agent at Barry Goldblatt Literary. During his career, he has worked with a number of authors in the sci fi/fantasy market. LIVE Manuscript Critiques from Published Authors ON SITE! Come join us - 2014's conference will be unforgettable! So I'm sharing a few sneak peaks at a book I have coming out this June. I've shown a couple of things over the past year but it's all finished and at the printers. I've seen some color proofs and I am sooooo excited about this book. It's been a growing experience for me since I don't think of myself as a wonderful watercolorist...especially in regards to landscapes. But this book had a lot of landscape type backgrounds so what else could I do but stretch and learn (it was all my idea in the first place...crazy me). 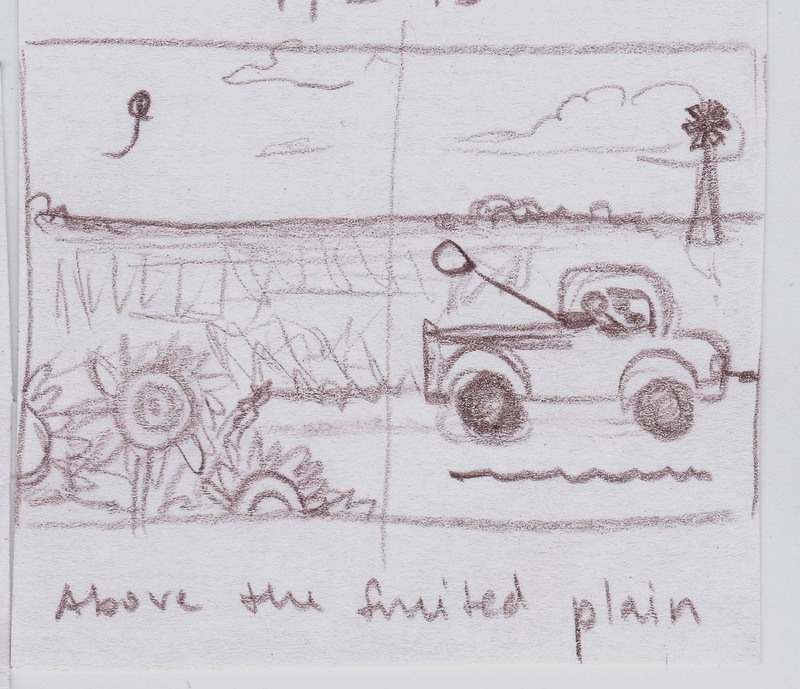 After a lot of research and looking at pictures and recalling childhood trips across country, out came the book in tiny thumbnail sketch form. 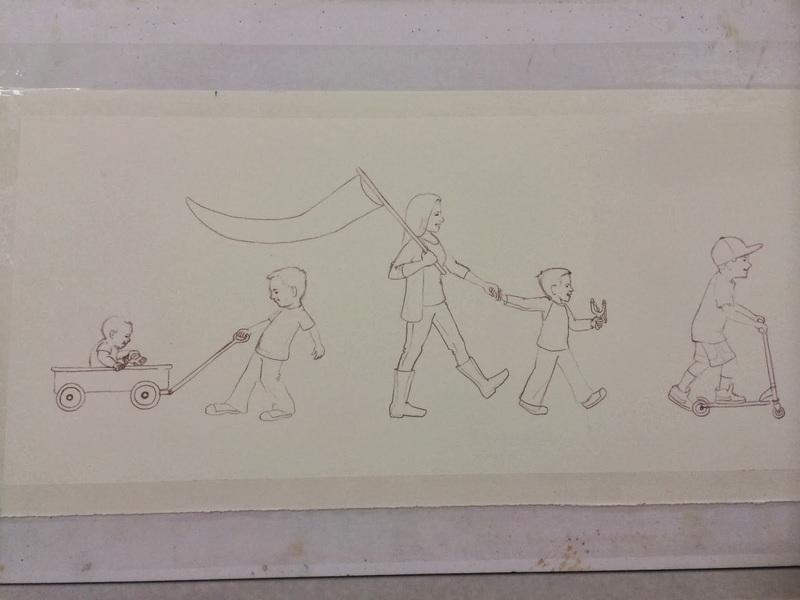 I'll show you the art process for one of the book's illustrations. cornfields under a big Kansas sky. So I take the backgrounds I paint and the foreground objects I paint and put them together in Photoshop. I've done a few "Kid Parade Portraits" fairly recently. One shown above was of my own kids (depicted younger than they are) and the other I'm sharing is of a friend's children. I show some of the process on that one too. 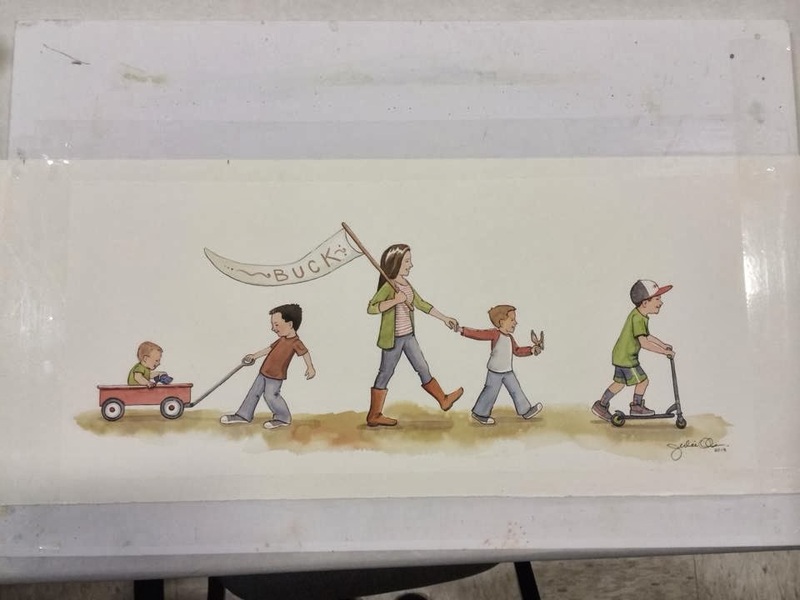 I did most of the actual painting of it at a School Art Auction night where I auctioned off a custom kid portrait (to be created after the auction) for whoever bid the highest. If you are interested in commissioning one for yourself or a friend, Contact Me under the contact button on my website. Over the Christmas Season, I had a chance to reflect upon some of the more unfortunate children in the world. I felt the responsibility to my own children deeply and at the same time realized that as a creator of children's books I also have a responsibility to children in that capacity. 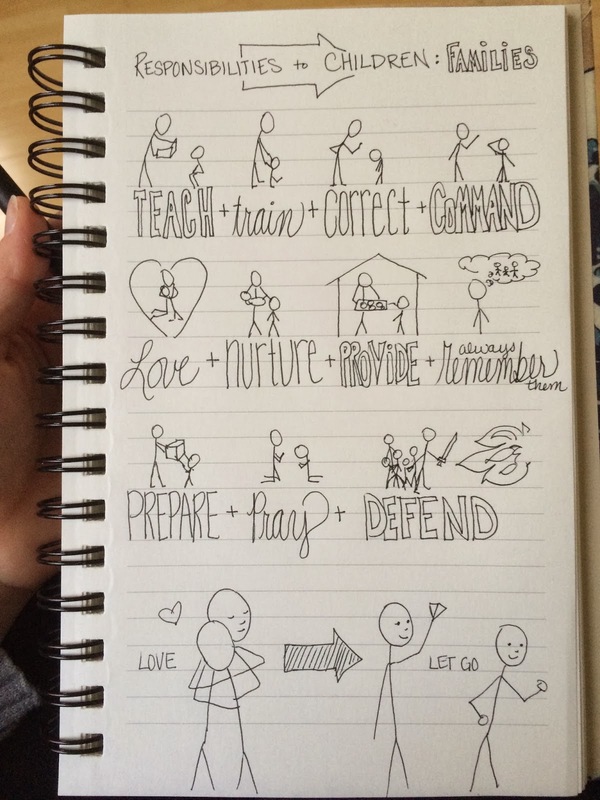 Here is a sketched note of my thoughts.